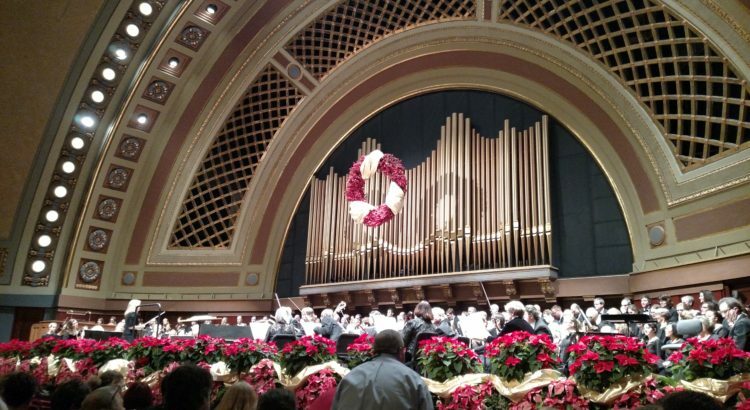 The moment that I entered Hill Auditorium for the Ann Arbor Symphony and UMS Choral Union’s performance of George Frideric Handel’s Messiah, the festive and joyful mood was evident. A double-layered border of beautiful poinsettias graced the front of the stage, and a large festive wreath seemed to float in midair in front of the pipe organ. The orchestra and Choral Union filled the stage, and anyone there could sense that it was going to be a night of merry music-making. Soprano Yulia Van Doren, countertenor John Holiday, tenor Miles Mykkanen, and bass Alex Rosen joined the ensemble as soloists. I have listened to recordings and even live radio broadcasts of Handel’s famous oratorio, but this was the first time that I have ever been present during a live performance of it, and it certainly did not disappoint. For one thing, the performers were of very high caliber – Scott Hanoian, the director of the UMS Choral Union is the former assistant organist and music director of the National Cathedral, and several of the soloists will be performing Messiah with the likes of the Saint Louis Symphony and the National Symphony Orchestra. Additionally, a nearly three-hour work written 300 years ago, it is impressively engaging. The audience was silent throughout, only to erupt in applause, cheers, and whistles at its conclusion. One of the most moving moments of the performance was the famous “Hallelujah Chorus.” Ushers distributed sheet music prior to the performance, and when the most well-known composition of Messiah was reached, Mr. Hanoian turned out from the stage and conducted the entirety of Hill Auditorium as the audience stood and joined the Choral Union in singing. I remember looking around during this and being overtaken by the sheer number of people singing around me and above me in the mezzanine and balcony. Centuries after it was composed, this music still has immense power to bring people together, and I honestly had chills during the chorus. It reminded me of why I love music so much, and of its most essential purposes. I also greatly enjoyed hearing the organ of Hill Auditorium in action. Normally the pipes are merely a backdrop for other performers, but during Messiah they came to life. For most of the piece, I was aware that the organ was playing, but it was on stops that blended with the orchestra and the vocalists. However, at the very conclusion of the work, all of the stops were quite literally pulled out, and I almost jumped in my chair out of surprise! The organ’s rich sound filled the entire hall, and its grand, majestic timbre is not something that I will forget in the near future. The Ann Arbor Symphony and the UMS Choral Union’s undertaking of Handel’s Messiah was an experience that has made me love and appreciate the work even more fully. Even if you are not typically into classical music, the melodies of the “Hallelujah Chorus” and “For unto Us a Child is Born” will stay in your head for days after. In my opinion, the chance to hear Hill Auditorium’s organ was worth it in itself! JM is a dual degree student in the School of Music, Theatre & Dance and the College of Engineering. Some of her favorite things include running, reading, all things creative, purple, and zebras. Wow, I’ve never heard the organ in Hill in action and now I really want to. Will have to make it a priority next semester!